by Brianna Crandall — December 14, 2018 — Grand Forks, North Dakota-based PS Flood Barriers, a division of PS Industries Incorporated, recently added a new HydroDefense Flood Plank Wall System (FP-535) to its line of flood protection barriers. Specifically engineered to protect extra-large openings such as loading docks, storefronts, retaining walls and full-building perimeters, this watertight flood wall system is custom-built using PS Flood Barriers’ proprietary flood planks, also known as stop logs, to address distinct flood vulnerabilities. 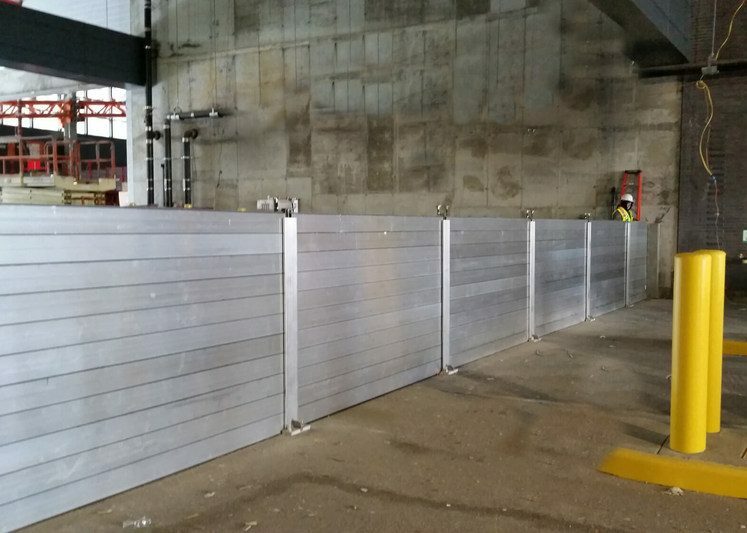 Part of the well-respected PS Flood Barriers’ line of products, the HydroDefense Flood Plank Wall System is made of extruded aluminum planks and durable seals that the company says have been fully tested to withstand the advance of floodwaters. The components have been engineered to stack together to form a structural watertight wall, and its T-lock seal mechanically locks in place. Completely customizable, the HydroDefense Flood Plank Wall System utilizes a unique spin-down latch that enables the wall to be set up to varying water protection heights. The HydroDefense Flood Plank Wall System features minimal components and simple installation, helping to prevent mistakes and delays in crisis situations. It utilizes flood planks of symmetrical shape, which allows for quick assembly because planks fit either way. When not in use, the HydroDefense Flood Plank Wall System can be stored away from the opening. When you’ve experienced a catastrophic flood firsthand like we have here in our hometown of Grand Forks, you know how important flood protection can be. Large openings can be especially difficult to protect, which is why we’ve taken all the best parts of our existing flood wall to create something even better. For municipalities, college campuses or companies with large facilities, HydroDefense is the right defense. To learn more about the HydroDefense Flood Plank Wall System, visit the product page on the PS Flood Barriers website. Established in 1974, the recently renamed PS Industries is a manufacturer of flood protection products (PS Flood Barriers), industrial doors (PS Access Solutions), and safety/fall protection products (PS Safety Access). With custom fabrication capabilities, PS Industries serves a wide variety of industries, including the military, energy, agriculture, food processing and all types of manufacturing.